I keep coming back to this idea of beautiful AND good. Aesthetics are important and we all want attractive landscapes, but of equal importance is this feeling that what we are doing is good for everyone and everything. It can be intimidating to change the way you garden or landscape. Choosing plants just because they are visually appealing simply isn’t a good enough reason anymore. Creating a habitat using plants that are adapted to your site is a far better approach to landscaping. Designs that have attractive combinations of wildflowers, grasses, shrubs and trees may initially capture our imaginations, but more and more people are wanting these plants and landscapes to provide additional benefits. Our gardens must now not only look good, but also do double duty to provide for pollinators, attract birds and other wildlife, develop habitat and positively impact the environment. It has taken a while, but native plants are finally getting the attention they deserve. They are viable alternatives to many of the overused plants you see in so many landscapes. There are literally hundreds of plants that will fit into your landscape design. Whether it is a true native species or “nativar” (a hybrid or new selection of a native plant), these plants offer qualities that will beautify the landscape and attract pollinators, too. 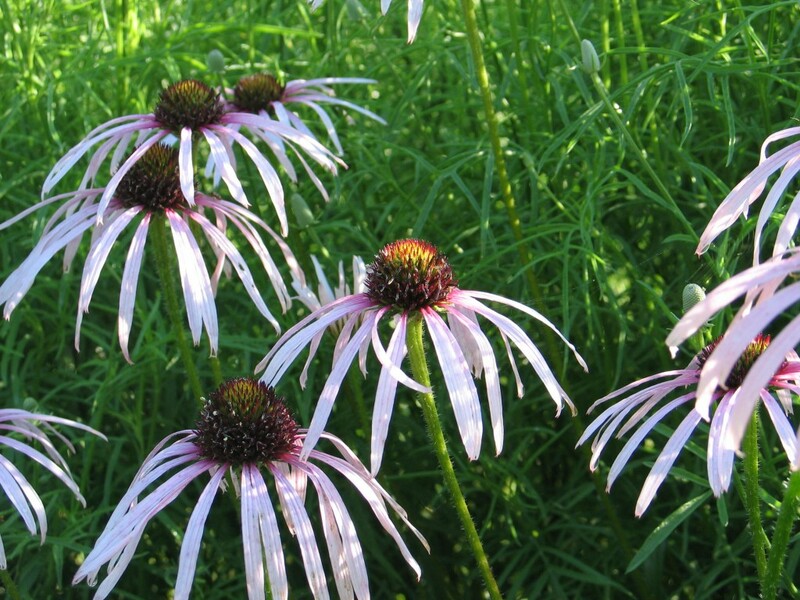 For people who live in prairie country, it may be easy to take our native plants for granted. Yet these plants, with their simple form and subtle beauty, can make attractive additions to the home landscape. We don’t think often enough about the water we use. It is a precious commodity. Remember the 2011 and 2012 drought in Kansas? We were using tremendous quantities of water to keep our landscapes alive. It made us evaluate each plant according to its response to these extreme conditions. Obviously, some plants did better than others and we lost some plants those years. It made us think critically about our plant choices and irrigation practices. A beautiful and resilient landscape that uses little, if any, supplemental water is an achievable result. A few changes like adding some native plants can make a big difference. It seems to me that these trends for 2019 have something obviously in common – native plants. Native plants are not the “be all” and “end all” solution, but they provide a good starting point to solving some problems you encounter in the landscape. With so much to consider when designing or redesigning your landscapes, don’t overlook native plants. You will be rewarded time and again by their unique beauty and deep roots. Spring is finally here and what a great feeling it is to be out in the gardens again, seeing supple green buds and new growth. But that is not all I am seeing these days — weeds, weeds, everywhere! Tons of henbit, chickweed, and bindweed invading our gardens faster than I can pluck them out. Here I provide a pictorial guide of our biggest offenders so that you might correctly identify these pests in your own garden and dispatch them quickly before they go to seed. Oenothera biennis, common evening primrose, is not the well behaved, short statured primrose we use in landscaping. This garden bully is tall, lanky, and spreads seeds everywhere! Identification trick: looks for the prominent white vein and semi-pointed leaf tips. I don’t like to throw that word around, and if you are unclear about what I mean by ‘weeds’ feel free to revisit my blog about proper lingo related to pest plants. In this post, I am simply meaning undesirable plants. This includes plants that may be native or naturalized, but are too aggressive or unattractive to be allowed in the gardens. This is a very subjective definition, but to keep this post brief, it must suffice! 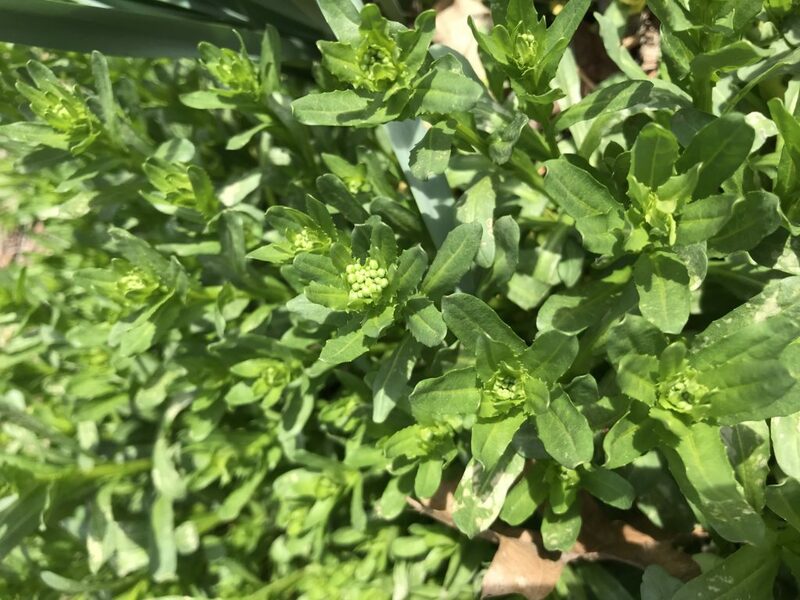 Pennycress, Thlaspi arvense, forms many leaves on its rosette before it flowers. ID tip: leaves are hairless and elongated, and they form a sort of nest for the budding flower. Wild carrot (Daucus carota) and spanish needles (Bidens bipinnata) are very hard to tell apart when they are young. No problem, because I don’t want either of them in this garden! This photo shows wild carrot. ID tip: look for hairy stems and smell the crushed foliage. It should smell like a bitter carrot. DO NOT TASTE THIS PLANT! 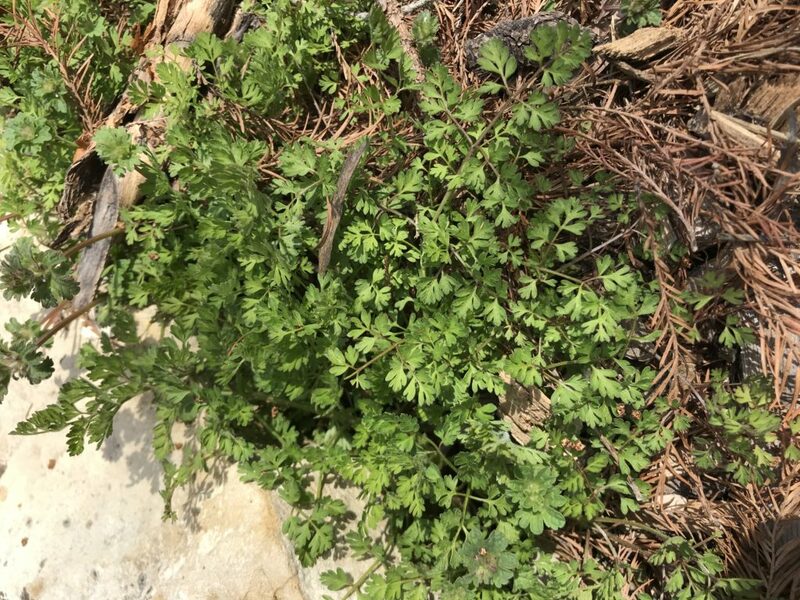 Wild carrot is very similar to poison hemlock, so do your homework and be safe. Plants are wonderful tricksters. It is often too hard to positively identify them in their early growth stages. In this way, weeds and desirable plants alike commingle in our gardens because we are afraid to accidentally pluck out something we want! Many young plants have basic, nondescript leaves and haven’t developed hairs, waxy coatings, or conspicuous colors that help humans tell them apart. Many weeds right now are in their rosette stage, without flower stems to distinguish them. So you must find other ways to suss them out! Each photo caption includes an ID tip to help you out. 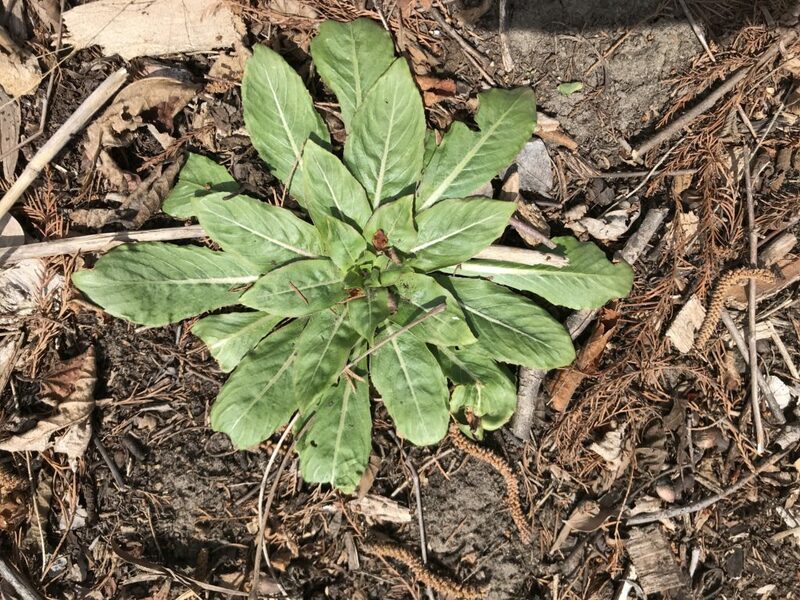 Wild lettuce (Lactuca serriola) is a rather pernicious weed that has weasled its way into our Birdwatch Garden. 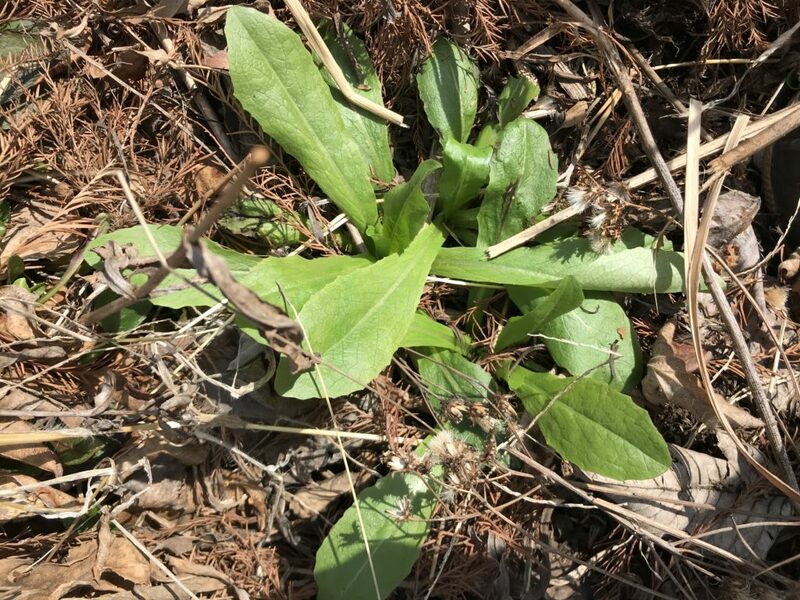 Some people use this plant as a wild-foraged addition to their salads, but I will stick with my garden spinach! ID tip: Wild lettuce will have spines on the underside of the leaves along the center vein. As it matures, its leaves stiffen and take on a bluish cast. Field pansy (Viola bicolor) are a member of the Viola genus, just like pansy flowers from your nearby garden center. 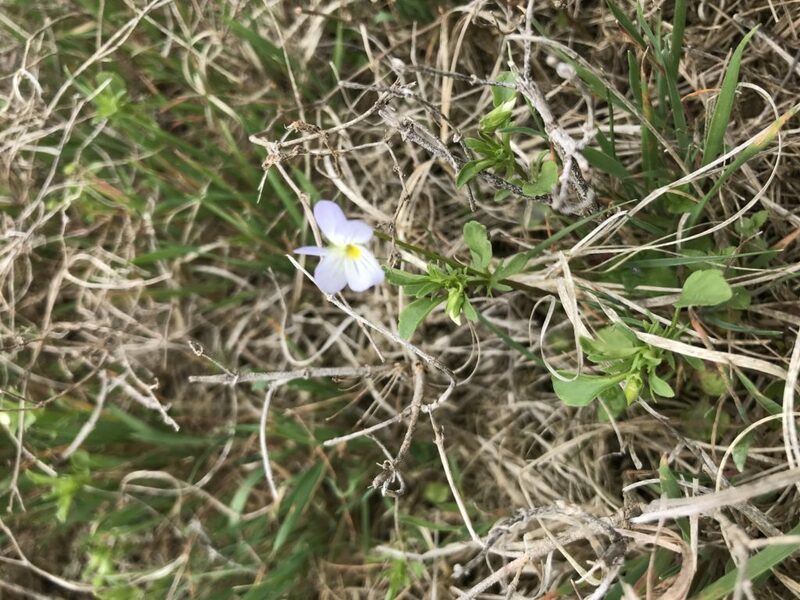 These adorable tiny flowers invade lawns and gardens alike. Could you stand to pull up something this cute? I don’t even bother. These add to the diversity of our lawns and they die away before the buffalo grass greens up. Keep an eye out for part two of this topic, wherein I dive deeper ‘into the weeds’ about which weed species are truly pests and which should be allowed to happily coexist in your landscape. Over the past several months, as I have been working on landscape designs for homeowners, I have been noticing a few trends. First, homeowners are increasingly interested in native plants. They understand the benefits of utilizing native plants both to the environment and the wildlife they are trying to attract. 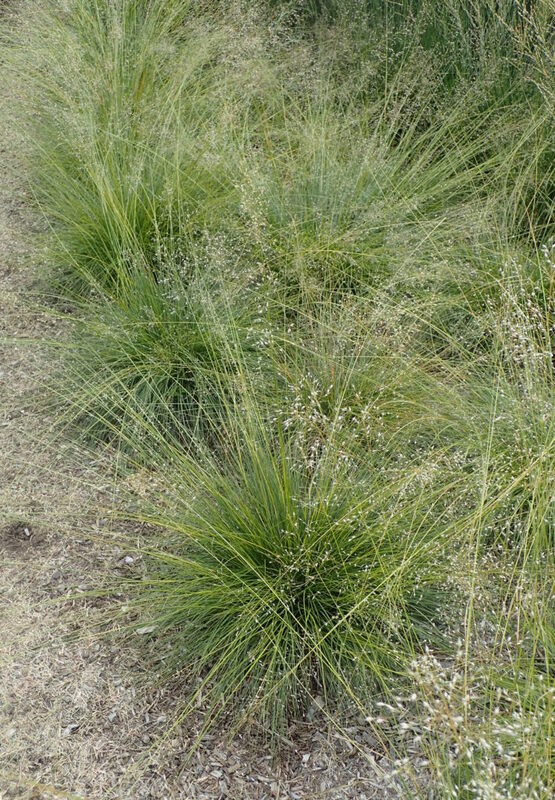 The advantages of native plants have been noted in previous blog posts. Secondly, they want something interesting happening/blooming in their landscape throughout the year. Thirdly, they want native grasses incorporated into the design. To help fill these needs, I have come up with a list of my favorite plants for the landscape that I try to work into most designs. If you need help with your landscape or have questions about using native plants, give us a call or come to the FloraKansas Native Plant Festival. We would be happy to visit with you. This grass is incredible! Do you need a vertical element in the landscape? Then this is the grass for you. 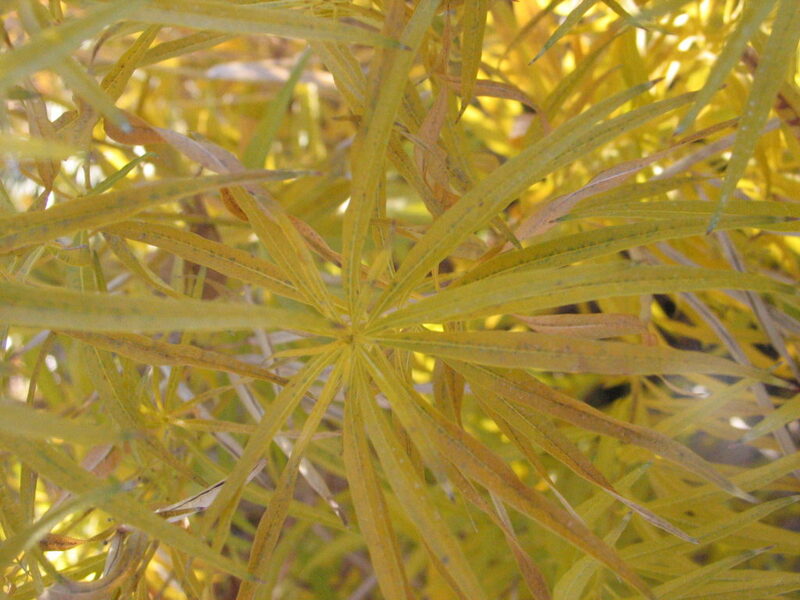 The upright clumps have wide steel blue leaves that turn a golden yellow in the fall. The unique flower panicles emerge in September and are held towards the middle of the clump close to the foliage. Ultimately, it reaches four to five feet tall. I love this grass because it will not fall over. At one time, this was one of the top selling grasses nationwide. It is a favorite of mine because it is long-lived and tough. It is so tough they are planted en masse in street medians. 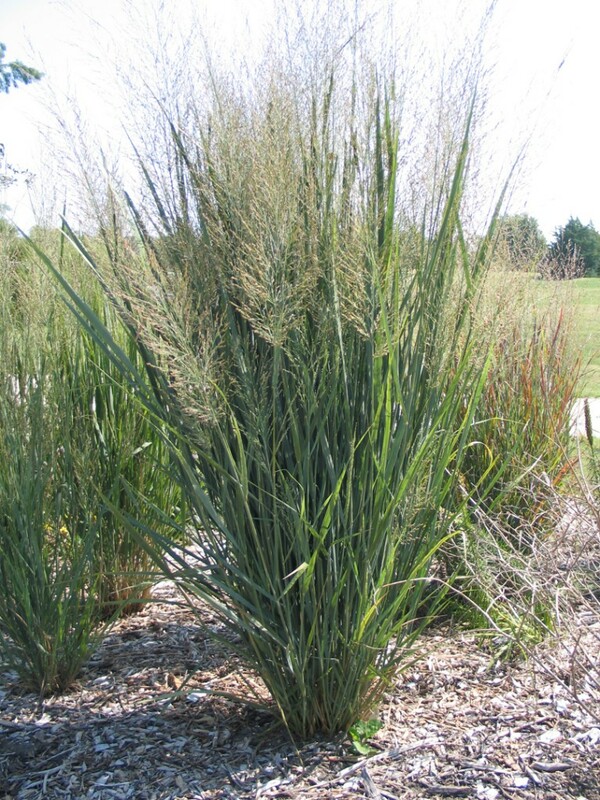 The fine textured leaves and airy, fragrant panicles are a nice addition to any landscape. Each clump can reach 12-18 inches wide and up to 24 inches tall. The entire plant turns shades of orange and yellow in the fall, providing multiple seasons of interest. It is great in a border, as a groundcover, in an informal prairie setting, or as an accent to other short or mid-range perennials. I like to mix it with short heath asters, purple poppy mallow, evening primrose or Missouri black-eyed susan. Some like it hot, but these like it really hot. 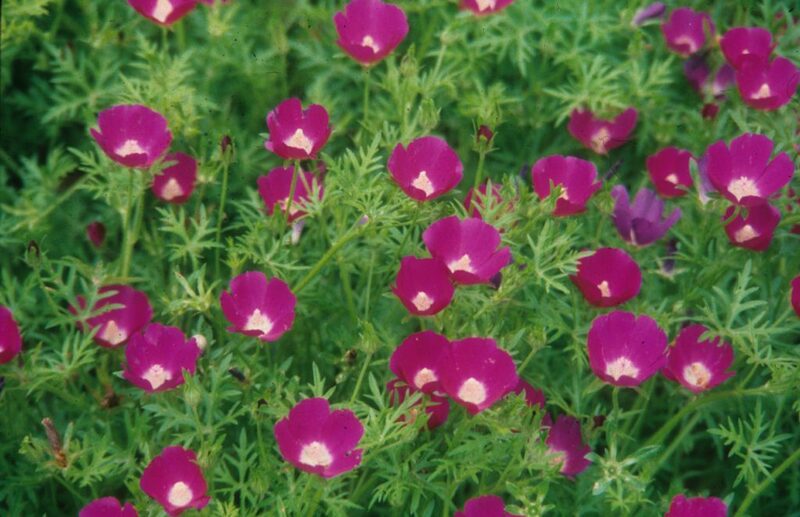 The deep tap root of Purple Poppy Mallow sustains it during times of drought. These roots are starchy and supposedly taste like a sweet potato. (I don’t know if I am that hungry, but it may be worth a try.) The magenta cup-like blooms appear throughout spring and into summer. 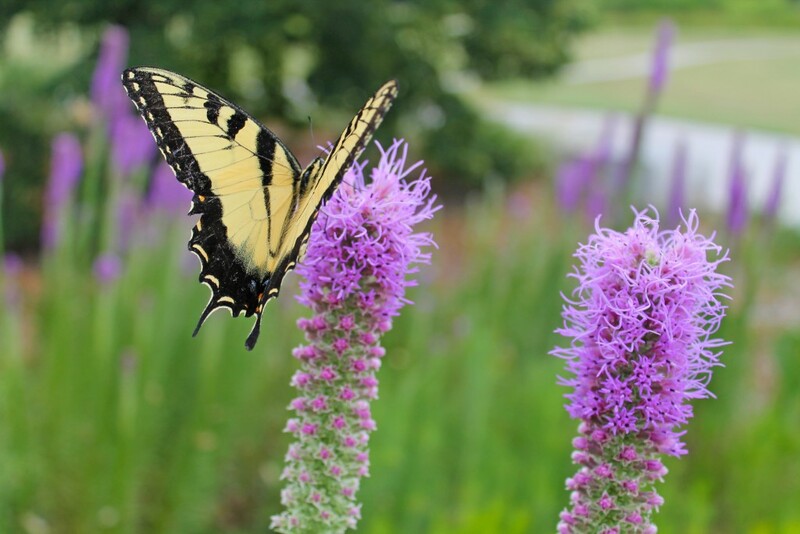 I like to interplant them with low grasses or shorter perennials that bloom later in the season, such as blazing stars or goldenrods. The stems hug the ground and ultimately spread 24-36 inches wide and 6-12 inches tall. I love this penstemon in the perennial border. The pink flowers in spring have just a blush of white and develop interesting seed heads. It adds outstanding form and texture to any landscape throughout the year. 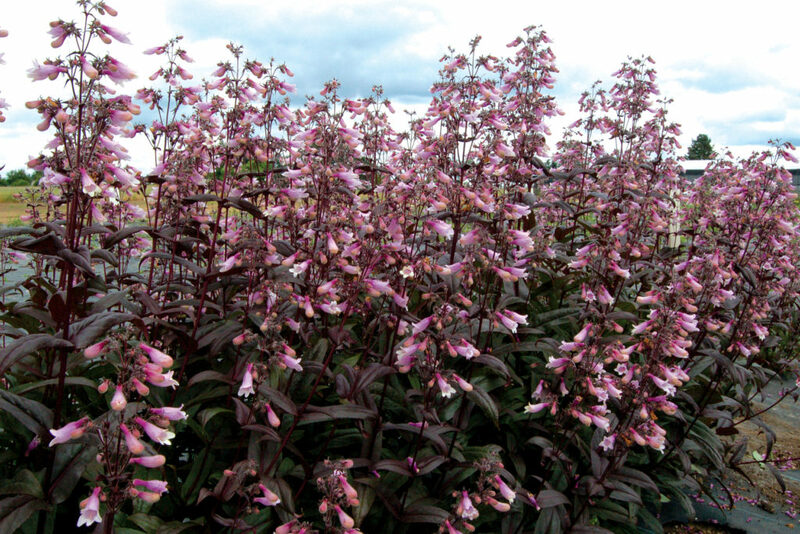 Penstemon ‘Dark Towers’ is a beautiful selection of smooth penstemon with reddish-purple foliage that is attractive even when blooming is complete. 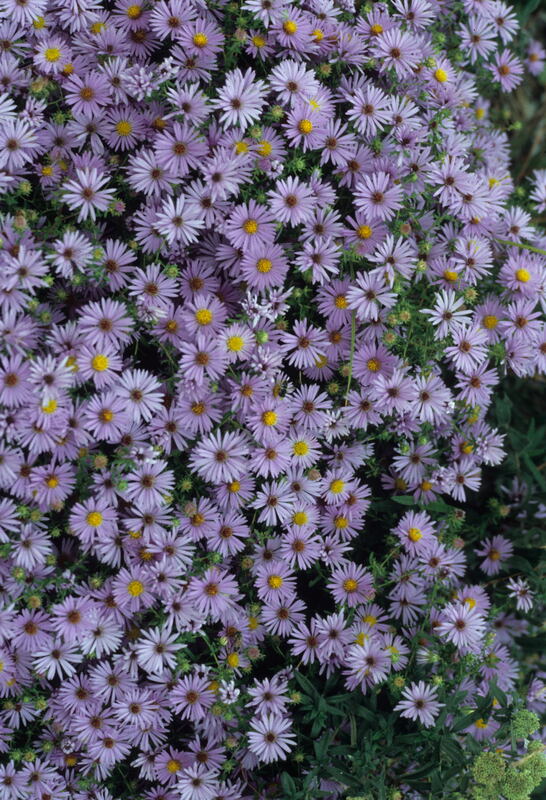 This diverse wildflower grows throughout the state, and is more drought-tolerant than other aster species. Its name alludes to its fragrant purple/pink flowers and foliage that exudes a pungent aroma. This species typically grows about two feet tall, but shorter varieties also exist. Garden-worthy varieties include ‘Dream of Beauty’ (one foot tall with pink blooms), ‘October Skies’ (2’ x 2’ with light blue flowers) and ‘Raydon’s Favorite’ (3’ x 2’ with light blue flowers). Butterfly milkweed is a stout one to two foot tall perennial with a deep, coarse, fibrous root system. Flowers vary in color from deep orange-red in the eastern part of its range to lighter orange and finally yellow farther west and south in Kansas. Unlike the numerous other milkweeds found in Kansas, butterfly milkweed does not exude a white milky sap when the stem is cut or a leaf is removed. 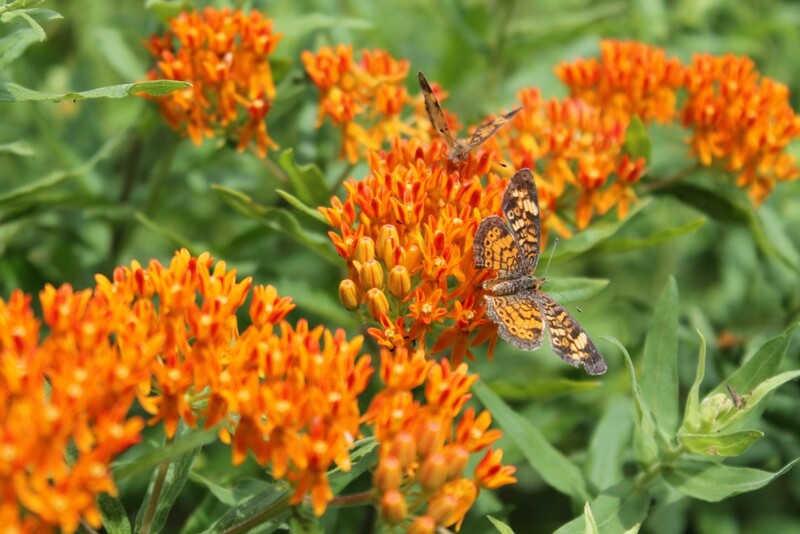 Do your garden a favor and include some butterfly milkweed. Its many ornamental and functional assets, plus its rugged character will make it a focal point in the summer garden for years to come. 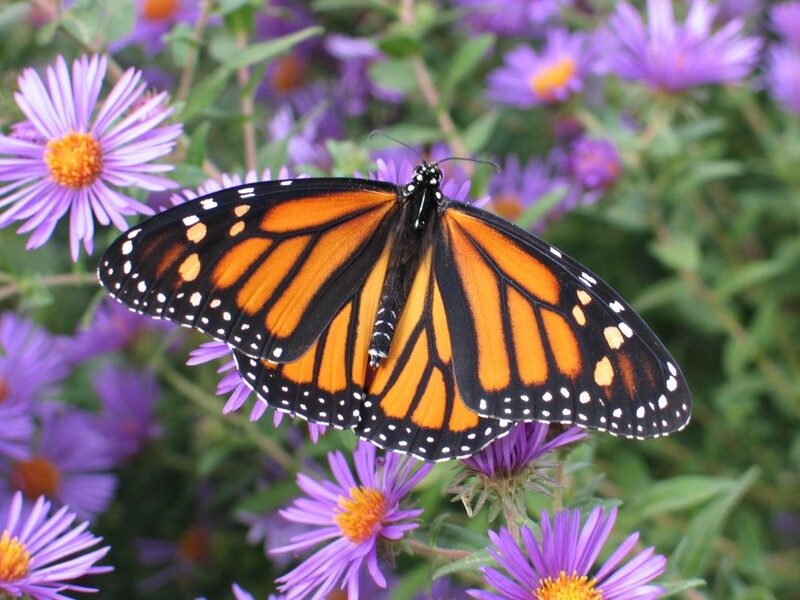 Plus, you will be rewarded as pollinators such as Monarchs seek out this beautiful native wildflower. I could choose many more garden worthy perennials, but I only have so much space. You can find these and many other native plants at our spring FloraKansas Native Plant Festival. CLICK HERE for the 2019 Native Plant Guide. These garden worthy perennials would be at home in any sunny spot in your yard. Why not give them a try?